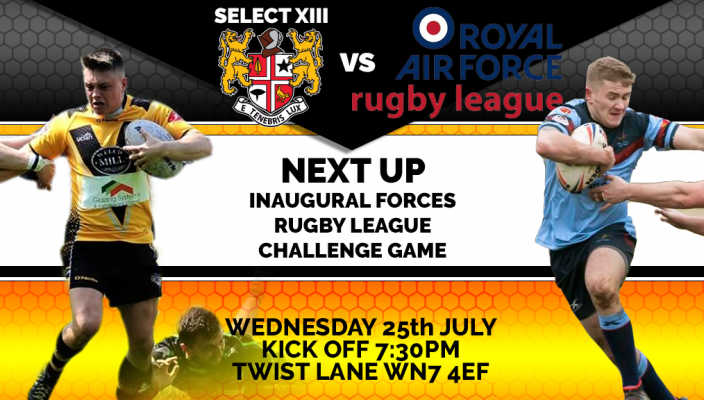 Leigh Miners Rangers is proud to play host to an armed forces challenge match on Wednesday 25th July (7.30pm) as the home club ‘Select XIII’ faces a Royal Air Force XIII in a friendly fixture. Rugby league as a sport is second to none in its relationship with the armed forces representative teams and Miners have a particularly close link to the air force with former players Garry Dunn and Steve Cooper having represented the club and the service with distinction. Garry has been instrumental in putting the wheels in motion for this fixture, which will see the RAF recruitment team from Liverpool and the Leigh branches of the air cadets and RAF veterans in attendance on the evening along with local dignitaries including Jo Platt MP, the Mayor of Wigan Borough and Lord Smith of Leigh attending as honoured guests. The club will also be supporting the RAF benevolent fund on the evening with proceeds from the raffle. Miners have played a full hand against the services teams having defeated the Army in the Challenge Cup in 2010 before succumbing to the Navy in the same competition two years later. They last faced the RAF in 2011 in a pre-season friendly. The intention is that this should become an annual fixture similar to that run by Wigan St Patricks and others across the NCL. On Saturday 4th August Miners Rangers celebrate their fiftieth anniversary ahead of the crunch NCL fixture vs Lock Lane as the club celebrates the 1979 and 1994 cup ties against neighbours Leigh RLC and past players from both clubs and both matches will be gathering at the club from midday for a buffet lunch followed by a Q&A session in the pitchside marquee, all are welcome to attend this event free of charge with a special commemorative programme also available.